Imported dural-track and transmission system, equipped with speed-down structure,three-phase motors, three-phase drive, make the cutting more smooth and running more stable. Equipped with high speed DSP control system, USB2.0 interface outputing directly, intelligent software, can support Autocard, Coreldraw and etc output directly. Speed and laser energy can be adjusted anytime, and very easy for customers to operate. Integrate water-protection system, ensures the service life of laser tube efficiently. Optional double laser heads cutting machine, redouble the water efficiency. Suitable for large and mediumsized enterprises in the mass production, and also suitable for small enterprise and individual processing. With CE and FDA certificate, more reliable. Large plastic cutting,two-layer plate engraving acrylic engraving/ cutting, sign carving, crystal, trophy, engraving sculpture and other licensing authority. Arts and crafts industry:wood, bamboo,ivory,bone,leather,marble carved shells and many other materials. Leather garment processing industry: Works on leather,synthetic leather,artificial leather ,cloth, fur, and many,other,materials,shows.personality in clothing,underware,furniture,gloves,handbags,shoes,hats,toys, and many other industry. Model making industry:production of construction model and models of ships and aircraft, ABC board cutting,plywood cutting. 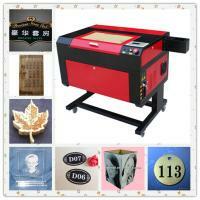 Packaging industry: printing rubber plate engraving, plastic plates,double plates,knife mold cutter board. Product sign making industry: nameplate making, marking in case of security. Other industries: marble, granties glass,cystal and other decorative materials carved marker, paper cutting,greeting card production.